Welcome to the Amanda Appleby online store. Step inside and allow time to stand still as you browse through our extensive collection of antique and other jewellery and eclectic collectables. Each piece tells its own mesmerizing story and could be yours in a few easy steps. Here you will find everything from period costume jewellery to accessories, vanity items, silver smalls and unique décor pieces – all lovingly handpicked by owner Marléne Druck, on her many travels, especially for customers who appreciate fine things from days gone by. Marléne started selling antique jewellery and collectables at a market in 1980. She went on to open the exquisite Amanda Appleby store in Sandton's Village Walk Centre in 1991. Amanda Appleby now enters a new era – an online store that brings customers, both local and further afield, that perfect collector's piece or gift for someone special. The store prides itself on its rare, one-of-a-kind wares that testify to quality and craftsmanship. To keep customers coming back for more, Marléne is forever expanding the collection, and no two pieces are the same! Scratch around in our online store for Victorian, Art Nouveau, Art Deco and post-war period jewellery pieces from all over the world, or treat yourself to modern or costume jewellery and many other distinctive accessories and collectables. You are sure to find many beautiful treasures in the Amanda Appleby online store! 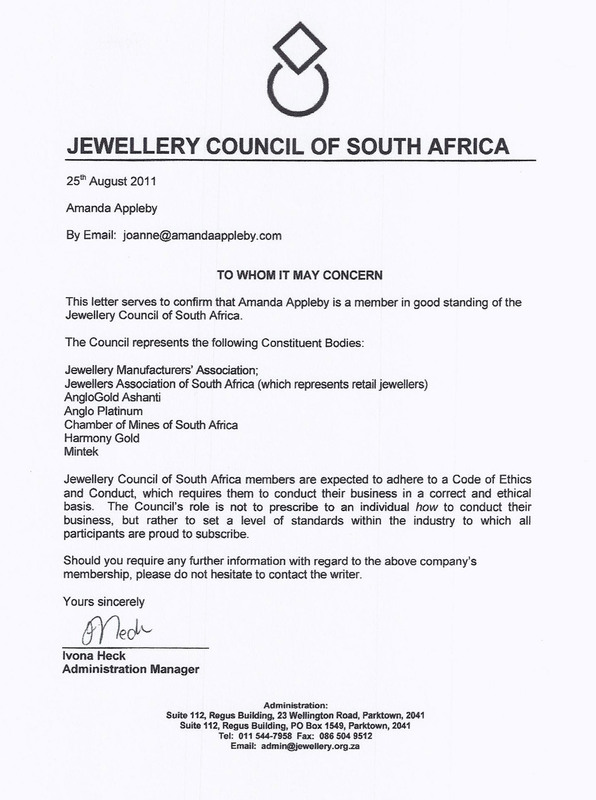 Amanda Appleby is a certified member of the Jewellery Council of South Africa, please click here to view our membership certificate.